This technique is one I have wanting to try since the last Nov/Dec 2006 Somerset Studio magazine came out. In it was a great article on "milk-resist" stamping. It came out great. The concoction of milks is very sticky to work with but comes out very nice on cardstock. 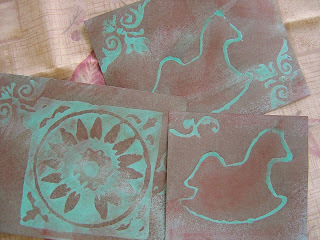 I attempted to use it on acrylic painted papers and chipboard but it didn't work at all. Basically, you stamp images on paper using 50% skim milk and 50% sweetened condensed milk. Then after heat drying, I sprayed it with a walnut ink spray and wiped immediately. These will be used for making tags and cards. Stay tuned. I truly love the milk resist technique and how your images turned out. I have never heard of it, so I must try it. Great idea! 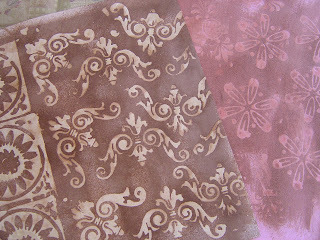 I love lettersandlace.blogspot.com! Here I always find a lot of helpful information for myself. Thanks you for your work. i was writing another article for somerset studio and i wanted to reference my article on milk resist. i found you! i just want to thank you for using my method and also your work is absolutely gorgeous!!! !